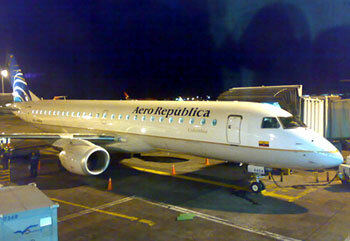 AeroRepublica is a Colombian based airline with hub in El Dorado Int'l Airport. Established in 1992 by parent company Copa Holdings S.A., Aerorepublica's headquarters is located at Bogotá, Colombia and the airline flies to over 11 domestic destinations across Colombia and to Panama. It also handles both domestic and international charter services to the USA and the Caribbean. 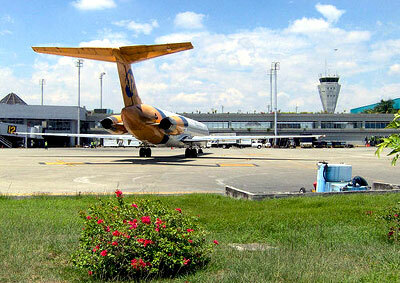 The airline also has its secondary hub located at José María Córdova International Airport, Medellín. The name of AeroRepublica's frequent flyer program is OnePass in conjunction with partners, Continental Airlines. Members will earn and accumulate miles from flights which they fly using either AeroRepublica, Continental Airlines or other associated partners. Members will gain extra benefits such as mileage bonus, priority check-in, priority seats and priority boarding. Aerorepublica also has code share agreements with Copa Airlines and Continental Airlines. AeroRepublica flies to cities in countries in North and South America, Caribbean and Central America.